Is your name Chris? Or Audrey? Or Dominic? There’s a Diet Coke out there with your name on it. 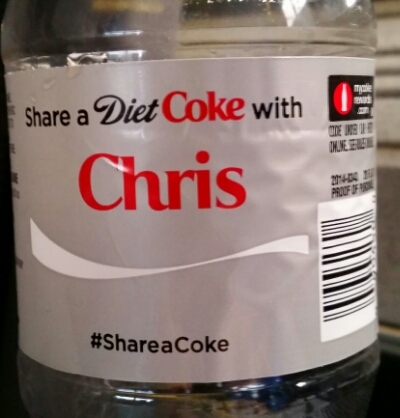 I found this bottle with Chris’ name on it at a hoagie shop near the Amtrak station in Paoli, Pennsylvania. When I asked the employee at the counter about it, he had no clue what Coke was doing. So I searched the bottle’s #ShareaCoke hashtag on Twitter and found a large community of people who had tweeted pics holding a bottle of Diet Coke bearing their own name! How lucky for them. I tweeted my Chris pic. Hopefully he (or she) will appreciate it. And if someone out there finds the elusive Carla bottle, comment/tweet/email/Facebook me. This is suddenly very important.